The opportunity for leadership development is one of the principle reasons why community organizers want to get involved in integrated voter engagement work. 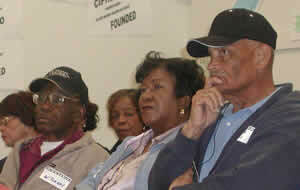 AGENDA, as Anthony Thigpenn explains, promotes leadership and organizing skills with a system of precinct leaders. Teams of two or, sometimes, more volunteers are responsible for the voter outreach in a precinct – ideally in their own neighborhood. This is a useful structure because it gives members of the community real opportunity to participate in and guide the project; however, precinct leaders must first be recruited and trained. The early canvasses of your voter engagement program will probably of necessity be led by your organization’s members and staff. The truth is that the basic work of the project – voter outreach and turnout – is substantial; trying to simultaneously pursue the leadership development piece may prove overwhelming. The solution is to devise a plan to reconnect with supporters and volunteers after the election to engage them in leadership development activities in preparation for the next. Henry Serrano says that this is one of the key lessons that CVH took from the 2004 election cycle, the debut year of the organization’s electoral program. “After the first year I think the biggest challenge that we knew we had to deal with the following cycle was how do we do the leadership development at the same time as trying to reach a larger volume of people,” he recalls. As he explains in the video, the solution that organizers came up with was to change the structure the project with two interactive parts: in East Harlem, the new targeted area, they would replicate the voter outreach work they had done the year before in the South Bronx, while reconnecting with South Bronx supporters and engaging them (and their networks) in issue ID and outreach activities. There were other lessons of the 2004 election. Instead of waiting until the next cycle to reconnect with supporters, “as soon as November 8th came we began working with the East Harlem group to do leadership training,” Henry recalls. Furthermore, they did a lot of work on issue ID in the weeks after the election, which laid the groundwork for voters to become engaged in the organization as well as the leadership training, and provided CVH with valuable insight into what their work for next year’s cycle should focus on. Henry says that their new base of voters – some 2,600 strong – was re-contacted soon after the election, “to get them engaged more deeply in the organization, to get them more familiar with the organization, to issue ID more clearly with people to see what they wanted to work on.” Within a month and a half after the election, they hosted five issue ID meetings. These proved particularly informative because, as Henry explains, this was “the first time CVH had really done geographic-based organizing.” Before organizers would seek out areas of the city where an issue that they were working on was particularly relevant; “if we were working on welfare policies, we would go all over the city to welfare centers,” Henry says. But this East Harlem base, although a “somewhat similar constituency,” had “very disparate interests.” What they learned from this community – the issues that people felt are priorities – enabled CVH to make the step from electoral engagement to policy organizing with them.